Automation Anywhere has released the industry’s first mobile app to securely manage RPA bots built using its intelligent RPA platform. By empowering business users to automate and control bots and their digital workforce from the palm of their hand, the new Automation Anywhere Mobile App will expand the reach of RPA and accelerate the development of the digital-first enterprise. Today’s consumers have unprecedented control because of the vast choice they have in an I-want-it-now economy. To meet this unprecedented demand, enterprises must remove all the barriers to exceeding limitless customer expectations while driving unparalleled business performance. Having mobile control of bots removes one more important barrier in automating the processes which meet this demand. Automation Anywhere is the first company to bring a secure mobile, on-demand solution to the RPA universe to help enterprises rapidly transition to a digital world. The new app is part of the company’s vision of helping organisations create an enterprise where human beings are not working like robots doing repetitive manual processes to compensate for the lack of automation. Instead, employees are liberated to do what human beings do best. The Automation Anywhere Mobile App allows user to start, stop, pause or resume bots, monitor the status of bots, and measures the ROI from their digital workforce in real-time. 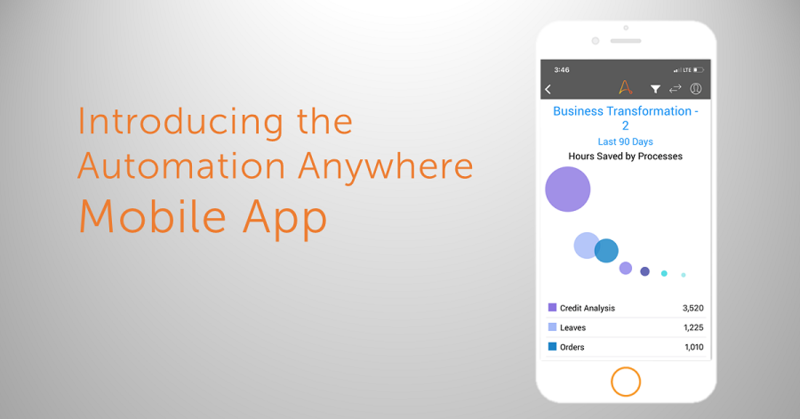 The launch of the new Automation Anywhere Mobile App for iOS and Android mobile devices is available to beta customers today and will be generally available at a later time in the quarter. Automation Anywhere is the leader in Robotic Process Automation (RPA), the platform on which more organizations build world-class Intelligent Digital Workforces. Automation Anywhere’s enterprise-grade platform uses software bots that work side by side with people to do much of the repetitive work in many industries. It combines sophisticated RPA, cognitive and embedded analytic technologies. Over 1,400 organizations use this AI-enabled solution to manage and scale business processes faster, with near-zero error rates, while dramatically reducing operational costs. Automation Anywhere provides automation technology to leading financial services, insurance, healthcare, technology, manufacturing, telecom and logistics companies globally. For additional information, visit www.automationanywhere.com.